Have you heard of Artistry? I hadn't either. I actually have my boss to thank for introducing me to the brand -- she was at a party recently and there were a bunch of Artistry items in the gift bag, and she ended up giving them all to me! Of course I gravitated toward the Artistry Lip Care Kit, because anyone who knows me knows that I am all about a good balm. I honestly had no expectations whatsoever when I pulled each of the lip products out of this kit ... but thankfully, they came through with flying colors! 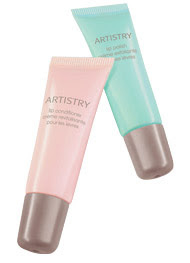 The two products in the Artistry Lip Care Kit are meant to make lips soft, smooth, moisturized, conditioned ... okay, you get the picture. And, you guessed it, it's a two-step process! The kit contains a Lip Polish and a Lip Conditioner, which, used in that order, work to make your pout really pucker. Let's begin with the Lip Polish. I'm all about a good body scrub, so why not one for the lips as well? And this one certainly does not disappoint. Tiny granules of bamboo extract in the formula work to exfoliate dryness and slough away dead skin cells without leaving behind any sort of funky aftertaste. You simply swipe on a bit of the polish and wipe off the excess with a tissue or cloth. The result? Instantly softer and smoother lips. Seriously, I noticed a difference within seconds -- and this was with chapped lips from 20-degree temperatures! I followed with the Lip Conditioner, which is formulated with antioxidants and Vitamins A and E for supreme moisturization and hydration. It also has synthetic beeswax, which just works to make lips that much softer and smoother. My final prognosis? This kit is totally worth it if you want your lips to be soft and kissable. And hey, who doesn't want that? Thank you for your blog post. I found so many interesting stuff in your blog especially its discussion. It’s absolutely crazy to find it wrapped and sealed somewhere! You simply swipe on a bit of the polish and wipe off the excess with a tissue or cloth. The result? Instantly softer and smoother lips. Seriously, I noticed a difference within seconds -- and this was with chapped lips from 20-degree temperatures! I guess I am not the only one having all the enjoyment here! Keep up the good work.